Colorful curtains, couch pillows, rugs, posters, chairs… Practically anyone has heard about these ways to add a splash of color to an interior without major repairs. Still, one always wants to try something new, especially when all the above mentioned options have already been put to good use. Perhaps, not even once… So, today we’d like to show you another 10 powerful tools to introduce a note of bright color to your autumn interior. Do you want your injection of color to be local and mobile? Why not start with a tray! This piece of interior décor and a functional container/organizer for small stuff storage would be as welcome in a living room as in a bathroom or kitchen. Feel free to experiment with different options – try to combine several active colors at a time, try different textures and shapes. And don’t forget that you may change the quantities and types of combinations every day! If you’re the one who don’t feel like ruining a neutral interior color scheme straight in a room, but still suffers from the lack of bright colors, consider a doorway. 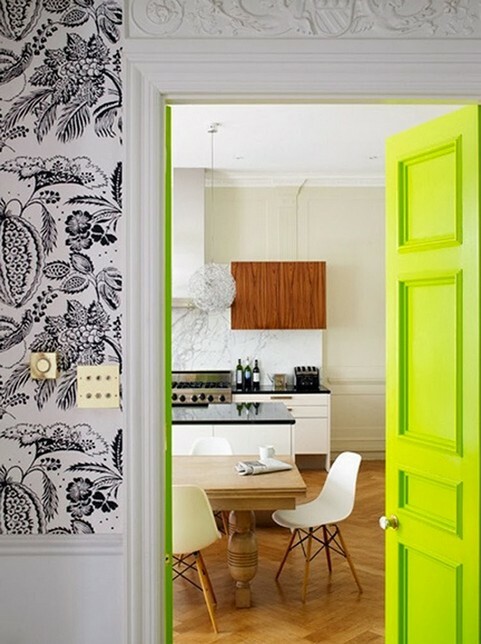 Whether it’s an arch or a full-fledged door, an injection of color on the border of rooms would look spectacular. And by the way, it really doesn’t have to match the general color of the room. This absolute must-have of home (and not just home) offices is gradually falling outside the scope of its familiar role and keeps winning more and more new territories in people’s homes. In the kitchen, corridor, bathroom and bedroom a perforated hardboard not just gives more room for storage, but also becomes a great interior accent. If you’re an owner of an old super hot cast-iron radiator, you most likely want to hide it away from prying eyes and disguise as much as possible. But why not challenge this aesthetically awkward piece of interior! Paint your radiator in some juicy saturated color and turn it from a piece taken for granted into a spice of interior décor. If you are keen on keeping up with the time and current trends, we’d recommend neon lights for your interior. They look bold, fresh and in no way provocative at the same time and may form a good alternative to a picture that has been hanging above your headboard for years. If your clothes are stored open, then your hangers just have to be not only convenient, but also beautiful. And they surely may play the role of color splashes brilliantly. Besides, anyone can make trivial wood, plastic or metal hangers brighter – just some paint and a free winter evening and that’s it! Books are the easiest and fastest means of introducing some color into your home. Editors hire cool designers for book covers for a reason: now what you see outside is almost as important as what you may find inside. If you don’t have enough bright spines to fill up the entire shelving unit, just arrange a few most beautiful pieces in a small, yet spectacular composition. Once there was a white (wooden, gray, etc.) bed in a white room… Sounds too neutral and a little dull, doesn’t it? If this sounds like a description of your room and a colorful bed linen or a bright headboard are not about you as well, you may find an unhackneyed way out; for example, paint the legs of your bed, nightstand or a bedside table some contrasting color. Such a trick looks very eye-catchy and can refresh any trivial or cheap piece of furniture in no time. To add color to an interior, one may start from a non-trivial detail: a picture frame, a vase, a candlestick or some piece of art – it can be a very small detail, but if you make it bright, it will catch your attention and even make you feel better. A basket is as useful in the household as a tray. Besides, it’s a great and unhackneyed tool for adding a splash of color to a neutral interior. The trendiest option so far is a wire basket: choose the shape and color to your liking and display it in plain view to reach the desired decorative and color effect. We hope that this post was interesting and useful to you and wish you good luck in your interior experiments!